A newly published study from Georgia Institute of Technology reveals that ballistic transport in graphene nanoribbons could result in a new class of coherent electronic devices. Using electrons more like photons could provide the foundation for a new type of electronic device that would capitalize on the ability of graphene to carry electrons with almost no resistance even at room temperature – a property known as ballistic transport. 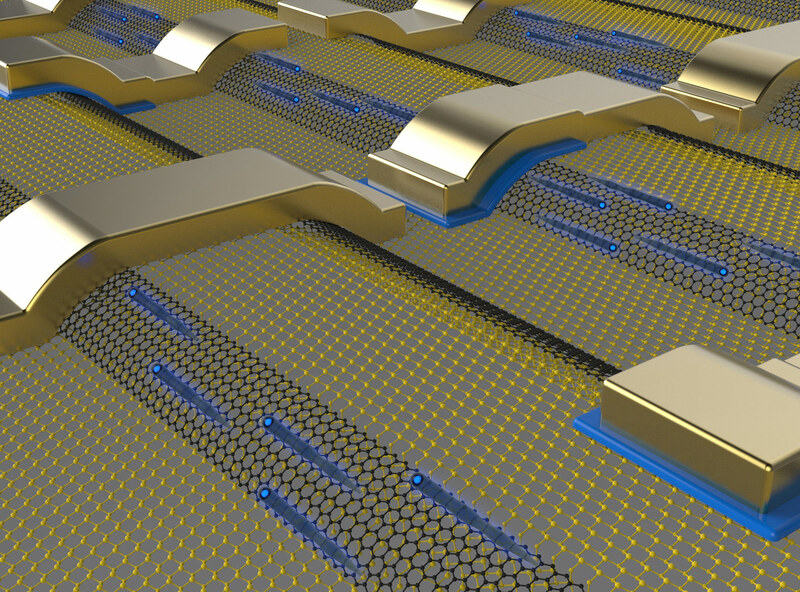 Research reported this week shows that electrical resistance in nanoribbons of epitaxial graphene changes in discrete steps following quantum mechanical principles. The research shows that the graphene nanoribbons act more like optical waveguides or quantum dots, allowing electrons to flow smoothly along the edges of the material. In ordinary conductors such as copper, resistance increases in proportion to the length as electrons encounter more and more impurities while moving through the conductor. The ballistic transport properties, similar to those observed in cylindrical carbon nanotubes, exceed theoretical conductance predictions for graphene by a factor of 10. The properties were measured in graphene nanoribbons approximately 40 nanometers wide that had been grown on the edges of three-dimensional structures etched into silicon carbide wafers. The research, which was supported by the National Science Foundation, the Air Force Office of Scientific Research and the W.M. Keck Foundation, was reported February 5 in the journal Nature. The research was done through a collaboration of scientists from Georgia Tech in the United States, Leibniz Universität Hannover in Germany, the Center National de la Recherche Scientifique (CNRS) in France and Oak Ridge National Laboratory – supported by the Department of Energy – in the United States. For nearly a decade, researchers have been trying to use the unique properties of graphene to create electronic devices that operate much like existing silicon semiconductor chips. But those efforts have met with limited success because graphene – a lattice of carbon atoms that can be made as little as one layer thick – cannot be easily given the electronic bandgap that such devices need to operate. De Heer argues that researchers should stop trying to use graphene like silicon, and instead use its unique electron transport properties to design new types of electronic devices that could allow ultra-fast computing – based on a new approach to switching. Electrons in the graphene nanoribbons can move tens or hundreds of microns without scattering. What does disrupt the flow of electrons, however, is measuring the resistance with an electrical probe. The measurements showed that touching the nanoribbons with a single probe doubles the resistance; touching it with two probes triples the resistance. The nanoribbons are grown epitaxially on silicon carbon wafers into which patterns have been etched using standard microelectronics fabrication techniques. When the wafers are heated to approximately 1,000 degrees Celsius, silicon is preferentially driven off along the edges, forming graphene nanoribbons whose structure is determined by the pattern of the three-dimensional surface. Once grown, the nanoribbons require no further processing. The advantage of fabricating graphene nanoribbons this way is that it produces edges that are perfectly smooth, annealed by the fabrication process. The smooth edges allow electrons to flow through the nanoribbons without disruption. If traditional etching techniques are used to cut nanoribbons from graphene sheets, the resulting edges are too rough to allow ballistic transport. The researchers measured ballistic conductance in the graphene nanoribbons for up to 16 microns. Electron mobility measurements surpassing one million correspond to a sheet resistance of one ohm per square that is two orders of magnitude lower than what is observed in two-dimensional graphene – and ten times smaller than the best theoretical predictions for graphene. Theoretical explanations for what the researchers have measured are incomplete. De Heer speculates that the graphene nanoribbons may be producing a new type of electronic transport similar to what is observed in superconductors. Georgia Tech researchers have pioneered graphene-based electronics since 2001, for which they hold a patent, filed in 2003. The technique involves etching patterns into electronics-grade silicon carbide wafers, then heating the wafers to drive off silicon, leaving patterns of graphene. In addition to de Heer, the paper’s authors included Jens Baringhaus, Frederik Edler and Christoph Tegenkamp from the Institut für Festkörperphysik, Leibniz Universität, Hannover in Germany; Edward Conrad, Ming Ruan and Zhigang Jiang from the School of Physics at Georgia Tech; Claire Berger from Georgia Tech and Institut Néel at the Center National de la Recherche Scientifique (CNRS) in France; Antonio Tejeda and Muriel Sicot from the Institut Jean Lamour, Universite de Nancy, Center National de la Recherche Scientifique (CNRS) in France; An-Ping Li from the Center for Nanophase Materials Sciences at Oak Ridge National Laboratory, and Amina Taleb-Ibrahimi from the CNRS Synchotron SOLEIL in France. This research was supported by the National Science Foundation (NSF) Materials Research Science and Engineering Center (MRSEC) at Georgia Tech through award DMR-0820382; the Air Force Office of Scientific Research (AFOSR); the Scientific User Facilities Division, Office of Basic Energy Sciences, U.S. Department of Energy, and the Partner University Fund from the Embassy of France. Any conclusions or recommendations are those of the authors and do not necessarily represent the official views of the NSF, DOE or AFOSR. Be the first to comment on "Ballistic Transport in Graphene Nanoribbons Suggests New Type of Graphene-Based Electronics"